The Uluru (Ayers Rock) is a large sandstone rock formation in the Uluru-Kata Tjuta National Park, which also includes the neighbouring rock formation of the Kata Tjuta (The Olgas). 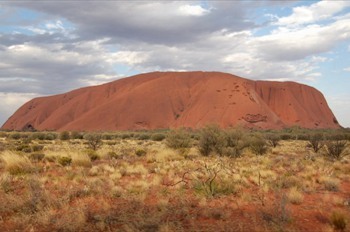 Both, Uluru and Kata Tjuta, came into being about 600 million years ago and are part of a subterranean rock formation. 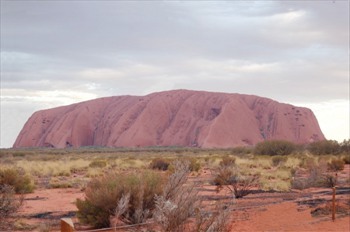 Thus, contrary to popular opinion, the Uluru is not a monolith. The gigantic "Island Mountain" has a length of 3,4 km, a maximum width of 2 km and measures more than 9 km in circumference. The peak rises majestically to a height of over 350 m above the surrounding plain. Uluru is composed of coarse grained sandstone, which contains a significant quantity of feldspar and quartz as well as other silicate minerals. The red-rusty colour of the rock results from iron bearing minerals by the process of oxidation. 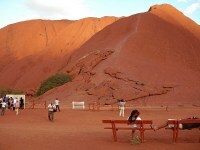 The most intriguing experience is sunrise or sunset at the Uluru. Depending on weather conditions and incident of light the huge rock can change its colour from a pale grey-red into a glowing orange or even fiery red and after that fades again. We experienced both, sunrise in a clear sky and sunset, when the sky was heavy with storm clouds. It is really lucky to experience this as, when the sun brakes through the dark clouds, the most contrasting colours appear. A spectacle beyond comparison! Many oddly shaped rock formations, caves, springs and water holes and, above all, the way the rock magically changes colour at sunrise and sunset, gave rise to numerous legends. No wonder, that the Uluru became a sacred site to the Anangu Aboriginal people and with it the Red Centre the spiritual heart of Australia. On rock caves and shelters still today well preserved ancient paintings can be found and bear witness to Aboriginal art and culture. 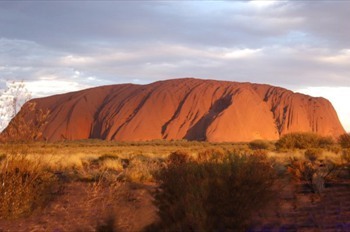 The Uluru is listed as a World Heritage Site for its exceptional natural and man-made attributes. There are many guidedexcursions including the tough 1.6 km ascent to the top of the Uluru, but you can easily explore this mysterious place on your own account, supported by brochures, or just following the marked paths, which guide you to the most interesting and sacred sites. 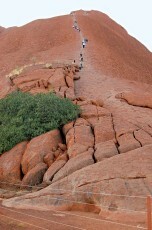 The major walk leads around the base of the Uluru, but there are also shorter walks. 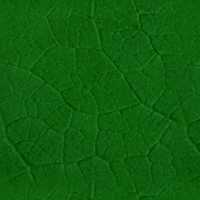 They all reflect in their own special way the mystery of dreamtime and give an inside into ancient Aboriginal culture. We decided on the two km long Mala walk, which tells of the arrival of the Mala people at the Uluru and the only 0,5 km long walk to Mutitjulu, a reliable water hole, which is an extremely important cultural site. The Mala Walk is also the starting point for Uluru climbing, but it is requested, that you respect the feelings of Anangu by not climbing the Uluru. 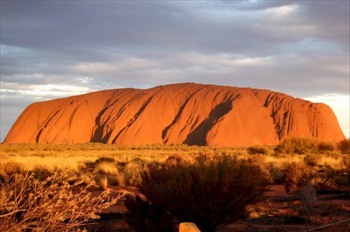 For a good choice of hotels with discount prices visit Place to stay in Ayers Rock.